Polar Bears need our help and they’re bringing an important message to Plymouth this winter. From November 25th through until March 3rd, 20 Polar Bear cubs will be let loose across Plymouth’s Waterfront. 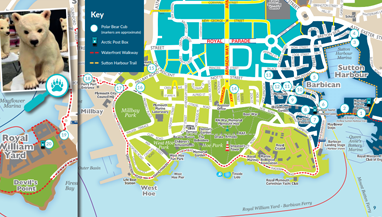 The cubs will be hiding in Sutton Harbour, The Barbican, Hoe, Millbay and Royal William Yard. Each cub will have a Bear Fact with them, telling us about the Arctic and the oceans, how plastic is affecting their home and how we can all help. Download the Polar Bear Explorer brochure here and using the Explorer form on page 11, write down the key word from each of the cubs’ Bear Facts. WWF, Greenpeace and the National Marine Aquarium have each helped to inform the Bear Facts. You can also download the map here. You can also view the brochure and map by clicking the images below. Once you’ve found all 20, complete the Explorer form with your details and make your pledge to help Polar Bears by reducing single-use plastics at home, at school and in the workplace. Deliver your Explorer form to one of the Arctic Post Boxes at either the National Marine Aquarium, the Barbican Tourist Information Centre or Bistrot Pierre. You can also mail it to: Polar Bear Explorer, Plymouth Waterfront Partnership, Ballard House, West Hoe, Plymouth PL1 3BJ or enter online here. • Prizes are as stated and cannot be transferred or exchanged. • Entries close at 12pm on March 3rd 2019. • There will be one unique winner per prize. Only one entry per person. • Specific T&Cs for each prize may apply and all are subject to availability. • Travel, parking, food, drink and any supplements or additions not otherwise stated in the prizes are not included. • The winners will be notified directly via the email address or phone number supplied. • Entrants have the option to opt-in to receive further news from Visit Plymouth and/or Plymouth Waterfront Partnership Ltd and the competition prize providers. • Plymouth Waterfront Partnership Ltd reserves the right to select an alternative winner in the event that we have reasonable grounds for believing that a selected winner has contravened any of these Terms. • Prizes have no cash value and cannot be exchanged. • Plymouth Waterfront Partnership Ltd reserves the right to terminate the competition at any point. Our decision is final with respect to any aspect of the competition, including the determination of any winners.